HONOLULU - The avenger-class mine countermeasures ship USS Chief (MCM 14) departed Sasebo Nov. 21 to join Japan Maritime Self Defense Force (JMSDF) MCM ships and aircraft in MCM exercise 3JA. MCMEX 3JA is part of an annual series of bilateral exercises held between the U.S. and Japan to increase proficiency and interoperability in mine countermeasure operations. 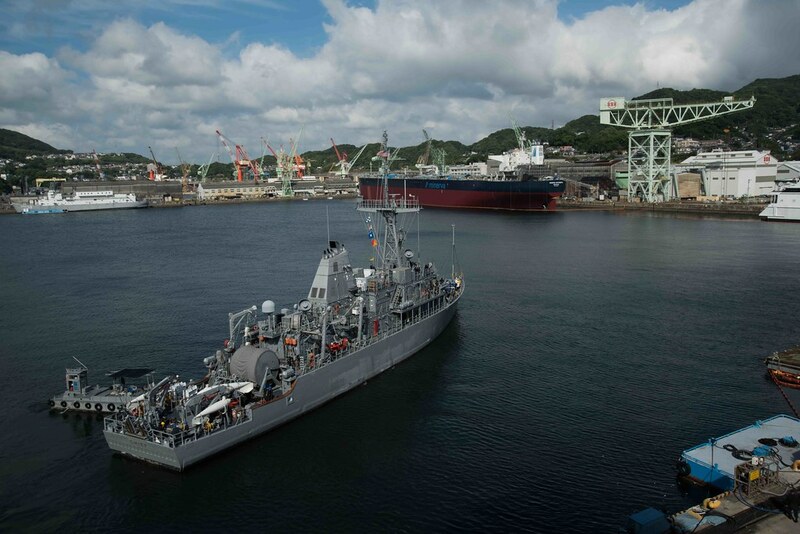 This will be the second year that Chief will participate in the U.S.-Japan bilateral exercise and follows its recent participation in the Multinational Mine Warfare Exercise with the Republic of Korea and United Nation Command Sending States. "Chief is excited to participate in this bilateral exercise with our Japanese allies,” said Lt. Cmdr. Frederick Crayton, Chief executive officer. Chief expects to conduct unit-level mine countermeasures tactics to include sweeping, hunting, and mine detection while also coordinating with JMSDF units to clear a route for ships through a simulated minefield in one of the designated exercise areas. Chief is part of Amphibious Force 7th Fleet, the Navy's only forward-deployed amphibious force, headquartered at White Beach Naval Facility, Okinawa.